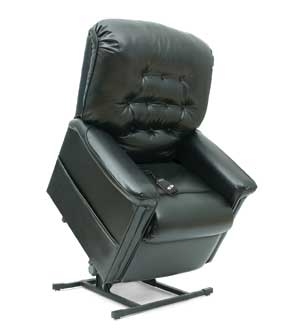 A Reclining Lift Chair Rental is a great relaxing chair to be in especially after a surgery in which you need it. Rising forward lift chairs are able to take the pressure off your upper body when recovering from a surgery or if you just do not have the body strength. These lazy-boy type reclining lift chairs are a minimum 3-position style lift chair and can recline back enough that you can even sleep in them. They are that comfortable! We have customers that come to Los Angeles from all around the globe for surgery and end up staying in a hotel where we deliver and setup the Rental Lift Chair before they even arrive. We also rent these lift chairs in vinyl so that they can be cleaned. Some may not like the idea of a vinyl type material but keep in mind a fabric lift chair rental can not be cleaned properly nor do we believe they even are cleaned. We use a hospital grade cleaner that is very expensive and cleans the material to the point we are more than comfortable renting it to our own family members. Rent one today - we will deliver whether its a hotel room or a residence.